Here's a bit of trivia in case you didn't read my previous posts where I mentioned it... Rain's favorite food is Shrimp Tempura. Although she calls it "Crispy Shrimps", every time we go out and you ask her "What do you want to eat", there's a 99% chance of her saying "Crispy Shrimps!". One time when Rina passed by Market! Market!,was intrigued with a sign she saw for a "Winter Seafood Tendon" from Tenya, a restaurant known for their tempura. During our next visit to Market! Market!, Rina asked if we could try it. Since I knew I would be outvoted 2-1 by my girls, I decided not to even try to protest and instead was excited to get my fill of some Tempura myself!. Rain ordered her usual Kids Meal #2 (P265) which included Two piece of Black Tiger Prawn Tempura, crispy Chicken Fillet, Onigiri, Ningyo-Yaki, and a bottle of Yakult. This is an incredibly creative way to serve a children's meal, as everything is placed in an adorable pink car, making meal time even more fun for our little Rainbow! I decided to try the Buta Kimuchi Tendon Bowl (P265 Regular 200g of Rice/P295 Large 250g of Rice), and found it to be incredibly filling. Wasn't a big fan of the Kimchi, but it was easy to just put it aside and enjoy the chunky breaded Pork Belly Strips with Tenya's trademark Don Tare sauce. We were there to fulfill Rina's wish to try the Winter Seafood Tendon Bowl (P395). I'm not much of a seafood lover, but I gotta say this was one glorious looking bowl of Seafood Tempura. 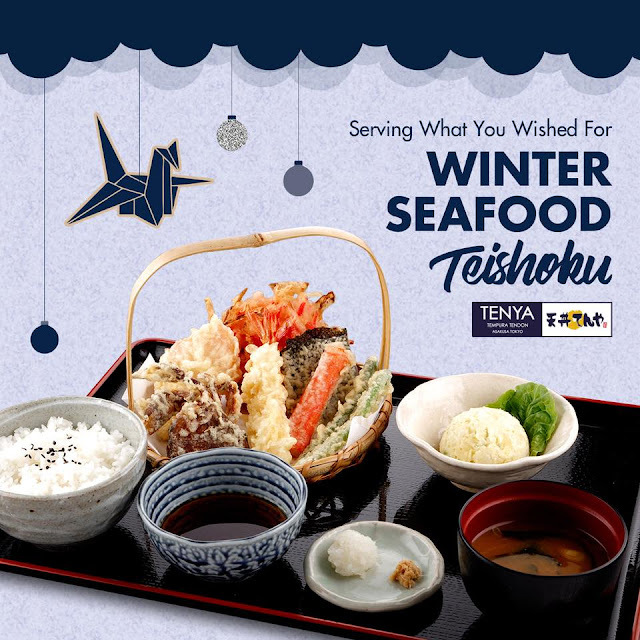 The Winter Seafood Tendon Bowl is composed of Black Prawn Tempura, Soft-Shell Crab, and Norwegian Salmon, all breaded and deep fried to the level of excellence that Tenya has been known for. The Seafood is then placed in a bowl atop a scoop of steaming white rice, with Red Pickled Ginger, A Kani Stick and Deep Fried Green Beans added to the mix. If that wasn't enough, The bowl also comes with a bowl of Miso Soup! With Rina's Winter Seafood Tendon Bowl pretty much wiped out, and Rains Kiddie Meal nearly annihilated, I think it's plain to see why Tenya has gotten a thumbs up from my girls! The Winter Seafood Teishoku (or "Set Meal") is also available for only (P425)! The set includes Black Tiger Prawn, Soft-shell Crab, Norweigan Salmon, Japanese Red Pickled Ginger (Benishioga), Kani Stick, Green Beans and served with Japanese Rice, Potato Salad and Miso Soup!